Estrogens control a wide number of aspects of human physiology and play a key role in multiple diseases, including cancer. Estrogens act by binding to and activating the cognate receptor (ER), however numerous studies have revealed that the G protein-coupled receptor named GPR30/GPER mediates also estrogen signals. As ER and GPER share the ability to bind to same compounds, the use of GPER-selective ligands has allowed a better understanding of the biological responses mediated by GPER. In the present study, we designed and synthesized two novel carbazole derivatives and then investigated their ability to interact with and activate the GPER-mediated transduction pathway in breast cancer cells. Both compounds did not activate the classical ER in MCF7 cells, whereas one of the two compounds synthesized triggered through GPER the rapid ERK activation in ER-negative SkBr3 cells, demonstrating a good affinity for GPER in docking studies. The characterization of this novel selective GPER agonist could represent a potential useful tool to provide further insights into the physiopathological role exerted by GPER. 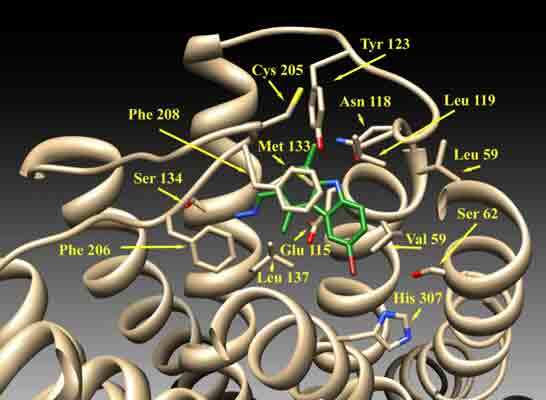 Breast cancer, Carbazole derivatives, Docking simulations, Estrogen/estrogen receptors, GPR30/GPER, Heterocycles. Department of Pharmacy, Health and Nutritional Sciences, University of Calabria, 87036 Arcavacata di Rende (CS), Italy.